RT4 model with Carabiner Clip and Q/C-1 connection. In an effort to offer the widest range of attachment options to fit the wide variety of tactical and military personnel needs, Hammerhead Industries introduces the new RT4 Series Gear Keeper featuring a Carabiner Clip, a general mounting system designed so you can grab your gear, use it, and know it will retract back into place until you need it next. Perfect for tethering all types of necessary tactical gear from GPS handheld units to flashlights, the RT4 Series with Carabiner Clip comes in a variety of retraction force options and extension lengths for whatever gear you need to keep close and accessible on your next mission. The new custom aluminum Carabiner is integrated into the mount and designed to have a short extension allowing you to keep your gear as close to your person as possible when stored. This helps to keep gear from clattering around, and maintaining a quiet presence, important when in the field. The lightweight aluminum is extremely strong and has a wide opening for easy attachment to a large D-ring or a belt loop. Designed like other Gear Keeper products to be as durable as possible in some of the most severe environments, the RT4 Series’ retractable mount has a patented flushing system that clears sand and debris from the unit. It is also salt-water proof and features a patented Q/C Connector System, which provides for quick and easy connection/disconnection of gear. The retractable line is constructed of high tensile Spectra/Nylon and coupled with stainless steel spring hardware all in a high-impact casing. All this makes for a device that boasts superior overall integrity and will be able to take knock after knock in the field. Available in a variety of sizes to accommodate different size and weight gear. The Model RT4-0040 has a retraction force of 85 gram (3 oz.) and extends to 91 cm (36 inch) ideal for lighter items. Model RT4-0061 has a retraction force of 170 gram (6 oz.) and also extends to 91 cm (36 inch) perfect for a small tactical light. The RT4-0064 has retraction force of 255 gram (9 oz.) enough for a GPS unit and extends to 81 cm (32 inch). Finally, the brand new RT4-0065 has a retraction force of 453 gram (16 oz.) and extends to 56 cm (22 inch) for even heavier items. In addition to the Carabiner attachment, RT4 Series Gear Keeper general mount is also available in other mounting options including a threaded stud mount, a Velcro strap mount, and a heavy duty snap clip. The original Geer Keeper system was engineered specifically for SCUBA diving literally born out of a need to secure items in situations when hands are otherwise occupied. 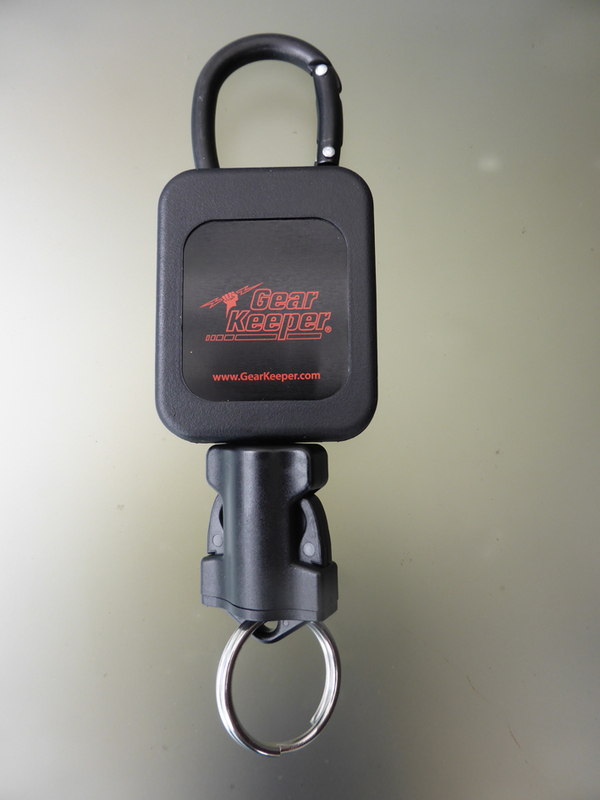 Gear Keeper systems are now available in more than 3,000 configuration options and used in applications from law enforcement, military and hiking to fishing, hunting and trucking. For more information about the new RT4 Series Gear Keeper with Carabiner, or other Gear Keeper Products contact the European sales office at Avera-Distributing in The Netherlands. This entry was posted in GearKeeper and tagged avera, avera distributing, Gear Keeper, gearkeeper, RT4-series. Bookmark the permalink.